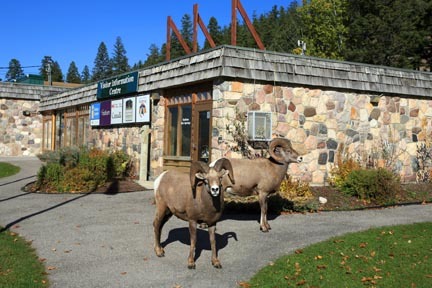 On this day, bighorn sheep greet people arriving at the Kootenay Visitor Centre. The best source of information when you arrive is Kootenay Visitor Centre (250/347-9615, 9 a.m. to 7 p.m. daily in summer, 9 a.m. to 5 p.m. daily in spring and fall), outside the park in the town of Radium Hot Springs, at the base of the access road to Redstreak Campground. Here you can collect a free park map with short hiking trail descriptions, find out about trail closures and campsite availability, get the weather forecast, browse through a small gift shop, buy park passes and fishing licenses, and register for overnight backcountry trips. The other source of park information is at Kootenay Park Lodge, at Vermilion Crossing (summer only). It’s worth noting that this is the only privately operated official information center in any Canadian national park–a reflection on the folks running this lodge. For further park information, check the Parks Canada website (www.pc.gc.ca). For park road conditions, call 403/762-1450.